Next week sees the start of an eight-part lecture series to commemorate the bicentenary of the Royal Edinburgh Hospital. NHS Lothian commissioned the series, and we’ve helped organise it, with the support of the Wellcome Trust and the Scottish Government. The lectures will run from October (the first one is next Wednesday) to June 2013 and will cover a wide range of topics to illustrate various aspects of the Hospital’s history, from patient art to the treatment of soldiers after battle, with discussion of gender, sport and the Empire in-between! It promises to be a really interesting series, and tickets are free to try and encourage as wide an audience as possible – we hope you’ll sign up to one or two, or all eight! The lectures have already proved popular, with just a few seats left for the keynote lecture next week to be held in Edinburgh Council Chambers. We’ve also been involved in the promotion of the lecture series. You may have already seen the recent addition to our homepage detailing the series (the image from the homepage, showing the Hospital in the 1950s, is reproduced below), and we’ve highlighted the series on Twitter and our Facebook page. We’ve also responded to some press interest and we’re looking forward to seeing an article about the Royal Edinburgh’s bicentenary, and the lecture series, that is expected to feature in the Scotsman on Wednesday next week. We’ll also be launching an archive appeal to run alongside the lecture series. 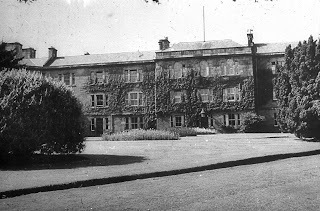 We hope that staff, patients and members of the public will search through cupboards and attics to see if they have any items that record the history of this important hospital. These new accessions will complement NHS Lothian’s rich collection of Royal Edinburgh Hospital material that is already held by LHSA. 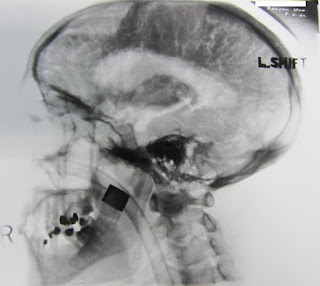 More to follow on the appeal in later blogs! A photograph from Dott's work at Bangour General (Emergency Medical Service) Hospital. Personal details have been removed. This week Ruth and Laura attended a training event in London to prepare for the pilot stage of archive accreditation. LHSA has been chosen, along with 19 other archive services in the UK, to take part in the pilot of the new Archive Service Accreditation Standard, being developed by The National Archives (TNA) in partnership with archives sector stakeholders. It aims to define good practice and will become the UK standard for archive services. The day gave the pilot participants the chance to work through the draft application form, and to provide comments on its content and structure. The three broad areas against which archives will be measured are: organisational health; collections; stakeholders and their experiences. TNA have asked for submission of applications by December 2012, with assessment due to take place in January 2013. Whilst it is exciting to be involved at this early stage, it is also a little daunting; a feeling that was shared by most participants at the training day! The process of compiling our policies, plans and procedures to show that we meet the requirements begins…watch this space for developments! As part of a recent accession of books, lecture notes and exam papers from a Royal Infirmary of Edinburgh nursing student, LHSA has also received some interesting nurse’s equipment. These are a laundry bag (our reference O553), collar (O552), and a name badge and blue ribbon (O554). 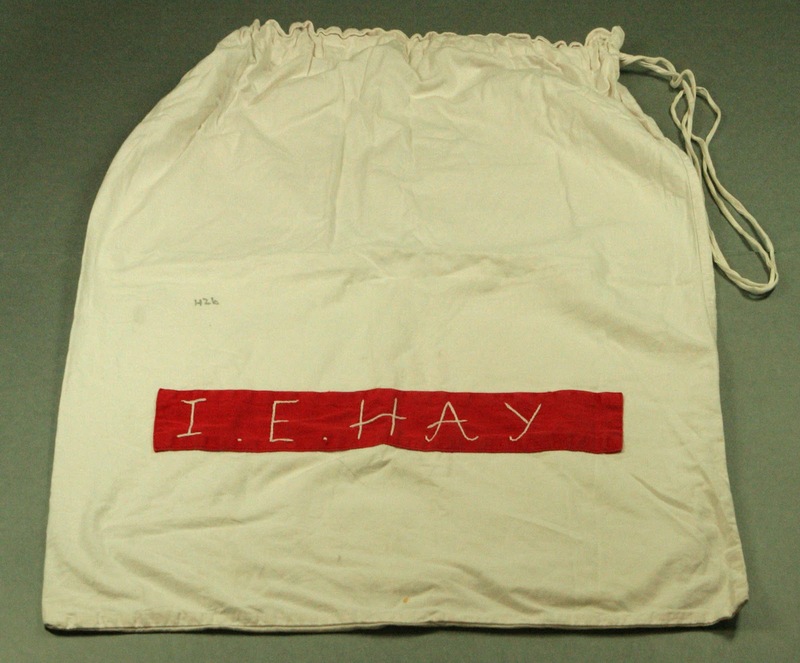 The bag would have been used to take work-stained clothing to the Infirmary laundry, and it has both the nurse’s name stitched onto it and a special laundry code, ‘H26’. It measures 630x770x20mm and dates from the early 1970s. The collar is made of a denim type material and was worn by first year students. 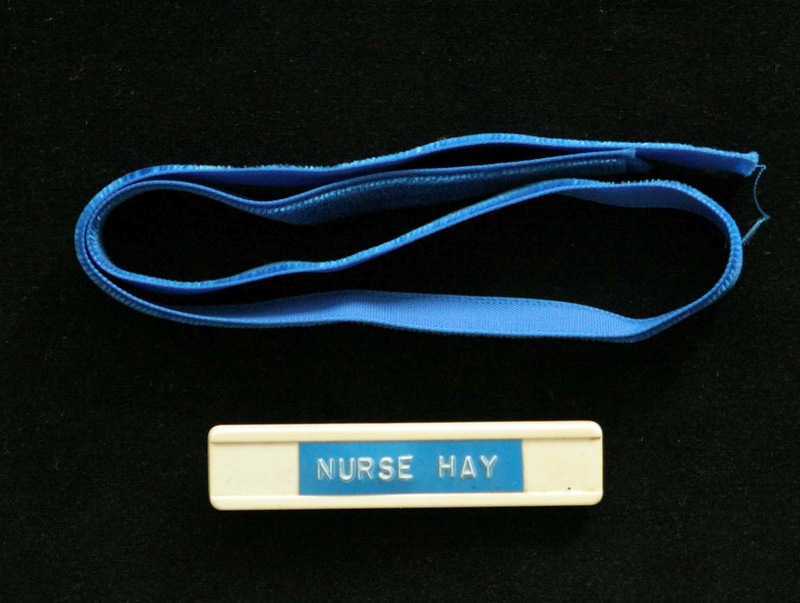 According to the donor, the blue velvet ribbon was to be worn with the blue nurse’s uniform after their final exams were completed. It was therefore to be worn with a strong sense of pride. 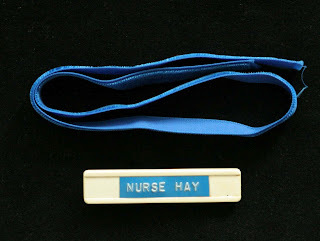 These effects give a small insight into the lives of nursing staff in Edinburgh and complement other hospital uniforms, badges and equipment which LHSA already has in its collections.